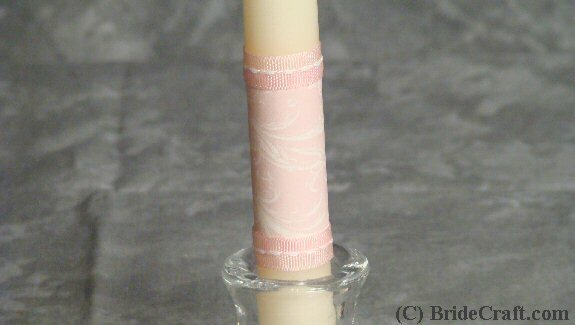 Design Your Own Custom Unity Candle With Paper! 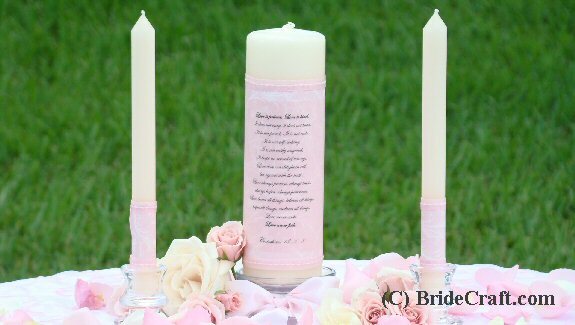 Does the idea of a paper unity candle with your own personalized message on it sound appealing? Is the price tag of a personalized unity candle set not so appealing? 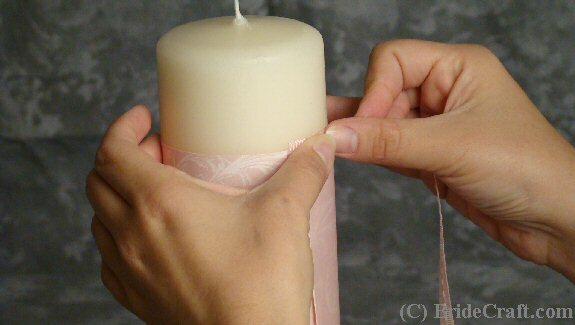 Then check out this project for a really easy (and lovely) way to make your candle special. Below you will find a step by step tutorial showing you how to do just that. Pros: Extremely easy project! A store bought unity candle set starts at about $30. This one can be completed and customized for about $15 (or less). Done months in advance, and made to match your theme or express the words in your heart. 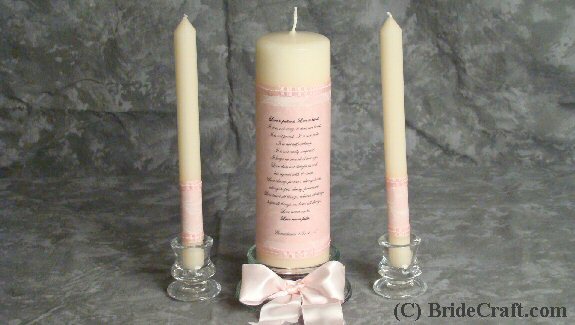 The paper can even be removed and the candle used again and again for other decorative purposes. Cons: Not many cons with this project. The only thing I can think of is that you might singe your fingers with the glue gun if your not careful. 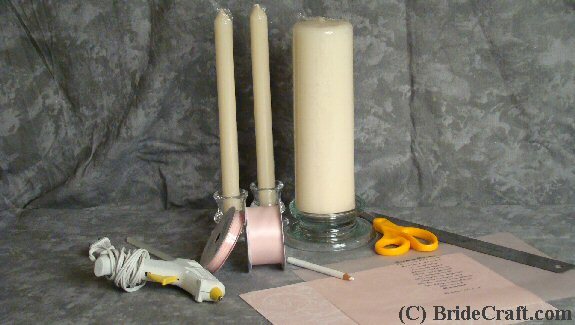 Step 1: You will need a glue gun and glue sticks, a pillar candle, 2 taper candles, a sturdy, thin width ribbon, thicker wired ribbon (optional), an 8.5 x 11 piece of vellum paper, several sheets of regular printer paper (for trials), a sheet of 12x12 decorative scrap book paper, a ruler, scissors, a light colored pencil and candle stands (your choice of). 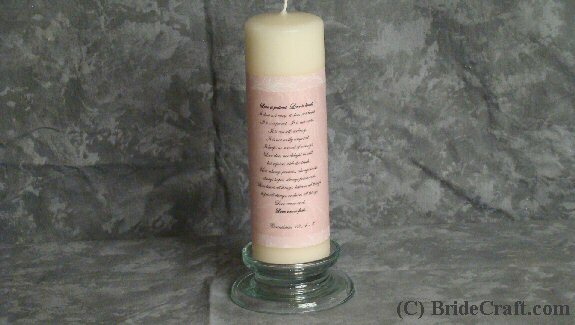 Step 2: Decide on the message you would like to include on your candle. Arrange it in your word processor with the spacing, alignment and font that you would like. When printing, make sure that you print the paper as “Landscape”, so it comes out the wide way. 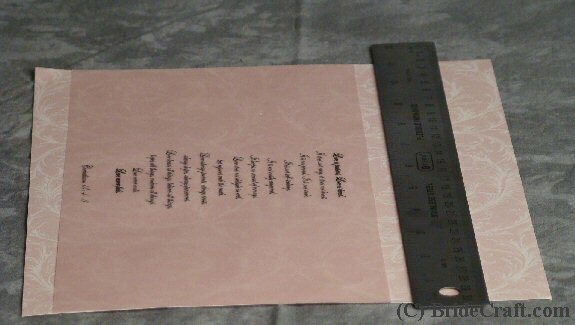 Line up the vellum over the decorative sheet of paper and decide how much you would like to trim off of it. Step 3: When you’ve decided how much you’d like to trim off of the sheet of vellum, that you use your pencil to mark the paper. A straight edge is important. Tip: Even if you decide to use a decorative edge scissor to cut your vellum, it’s still important to make the edge look “straight”. This will make the final product look much more professional. Step 4: Carefully cut along the line. At this time, trim your 12x12 sheet of decorative paper down to at least ½ an inch bigger on either side. Tip: Like the vellum and the decorative sheet up. You want the vellum sheet to be smaller. 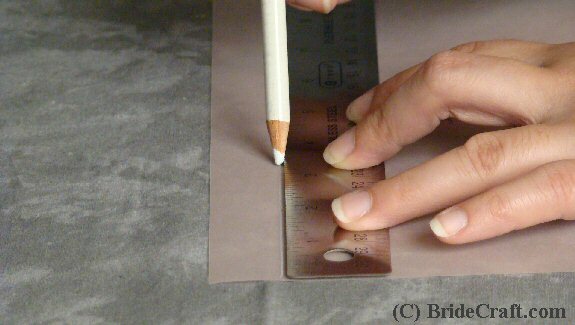 Step 5: Line up your decorative sheet and your vellum sheet so that the vellum is centered. Dab a line of glue along the far edge of the decorative sheet, and then carefully attach the vellum sheet. Press to secure. Tip: Watch those fingers! The glue will singe you right through the paper if you're not careful. 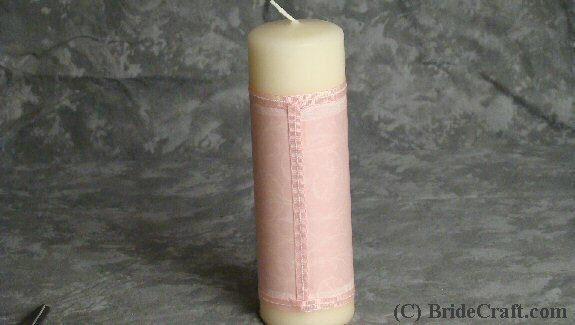 Step 6: Wrap your two joined papers around your pillar candle. Make sure that the paper is lined up to your satisfaction. Then glue the paper onto the paper to secure. 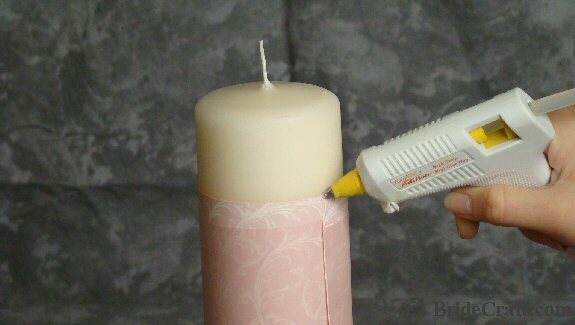 Tip: This is basically making a “tube” effect around the candle. You MUST glue to the paper, not the wax. The wax will melt, leaving you with paper peeling off. Step 8: Now put a good dab of glue at the top seam of the paper “tube”. Step 9: Take your smaller accent ribbon and press it into the glue. Continue to glue around the top of the paper “tube”. Tip: Remember, glue the paper, not the wax! Step 10: Follow the glue quickly with the ribbon. This is effectively hiding any ragged edges that might not look as good. Step 11: Follow the seems down completely and make sure there are no unfinished edges. Step 12: Fold the ragged end of the ribbon under, gluing to secure. Step 13: You should have something like this now. 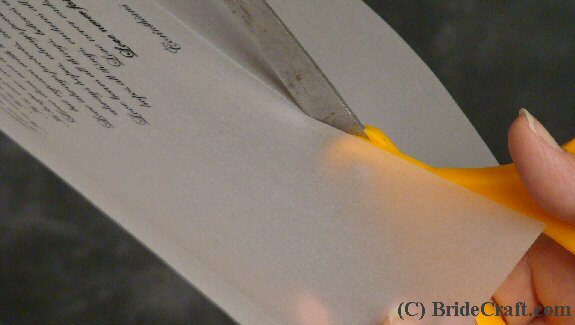 Step 14: Repeat these same basic steps with the tapers, leaving out the vellum unless desired. Step 15: The taper should now look something like this. Step 16: Optional! 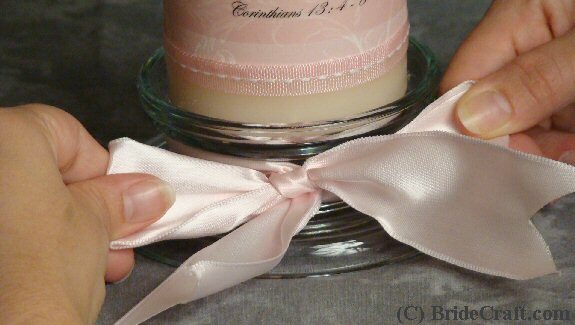 Take the thicker, wired ribbon and tie it around the base of the pillar candle stand in a simple shoe string bow design. Shape the ribbon. Tip: Wired ribbon is the best for getting things to stay. Step 17: And here you have your candle. Store in a clean dry place FAR away from heat (no leaving it in your car for any reason.). And enjoy on your wedding day, and possibly during years to come!